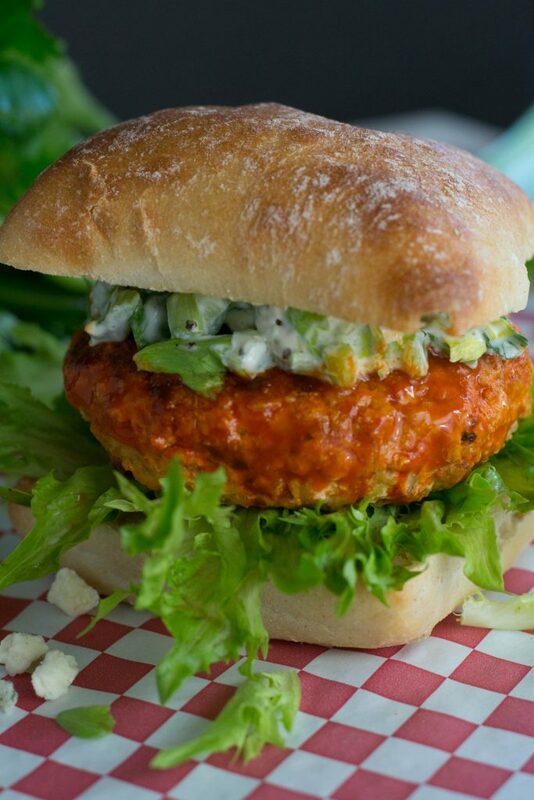 Buffalo Chicken Burger with Celery Blue Cheese Topping - What the Forks for Dinner? It’s been awhile since we’ve made burgers. 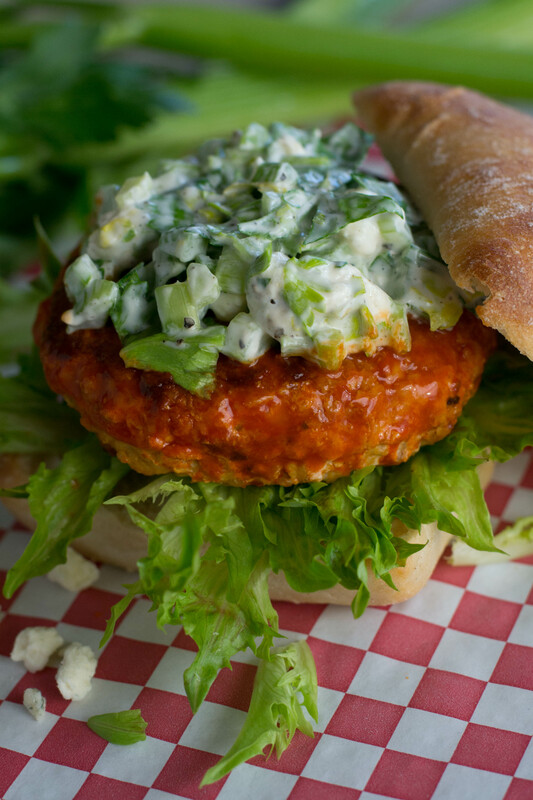 I love any burger made from ground chicken, and it needs to be spicy for Tim. 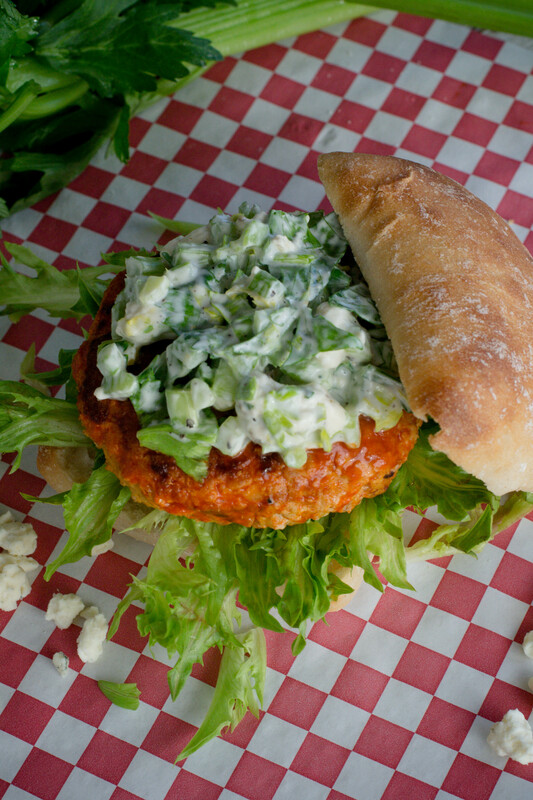 Buffalo Chicken Burger with Celery Blue Cheese Topping. Buffalo wings are always a favorite with their spicy hot sauce, a cool blue cheese dressing, and crunchy celery sticks on the side. Why not combine all those flavors into a killer burger? Well, thats just what we did. Ground chicken combined with spicy hot sauce, onion, garlic, egg and panko crumbs to bind it all together. 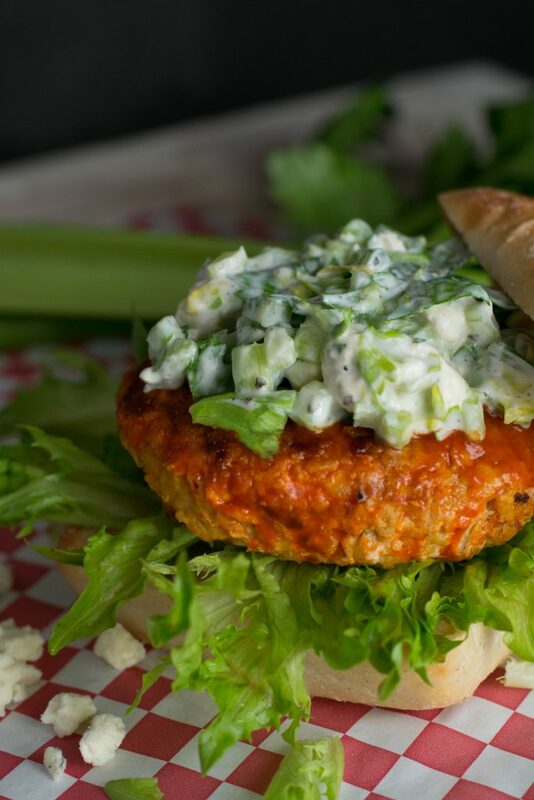 Marinade the burgers in more hot sauce, then grill or cook in a skillet. Delicious! Even more delicious, is the topping. I never think of celery for anything but soups or with some peanut butter as a snack, certainly not in a burger topping. If I wanted all the components of the buffalo wings, I had to have blue cheese and celery…so I mixed them together. Perfect! 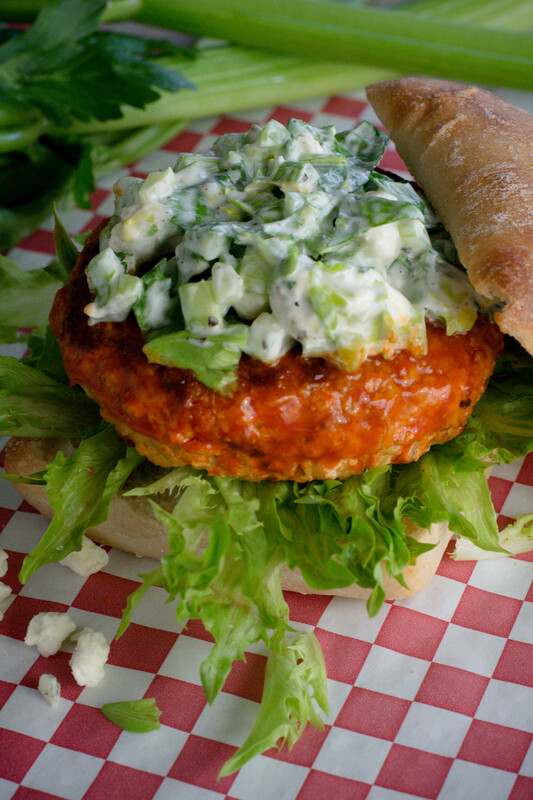 All the taste of the chicken, blue cheese and celery in one awesome sandwich. Swapping gorgonzola cheese for regular blue cheese was purely a personal thing for me. Gorgonzola has a salty, robust flavor, and is more crumbly that other blue cheeses. It comes down to personal preference, so what ever yours is, use the cheese you like best. For our money, there is no better vessel for a burger than a ciabatta bun…. a nice crisp outside and a chewy inside. When you slice the bun, there are holes on the inside that catch any sauce or flavor from your sandwich. The only other garnish was a bit of green lettuce, my nod to a traditional burger topping. Although truth be told, I did remove it when we ate the burgers, so if you chose to leave it out, it will not affect the taste of the burger one bit. Looking for a non-traditional burger Buffalo Chicken Burger with Celery Blue Cheese Topping is a sure winner! Combine ground chicken, the 2 tablespoon hot sauce, onion, garlic, egg, and panko crumbs in a large bowl, do not over mix. In a shallow container (enough to fit 3 burgers) pour 1/4 cup hot sauce and spread over the bottom. Shape chicken mixture into 3 patties and place in the hot sauce. Pour remaining hot sauce over patties. Place in the refrigerator for about 10 minutes. Heat your grill, grill pan, or skillet over medium high heat. Spray with nonstick cooking spray. 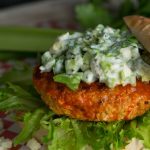 Cook the burgers for 3 to 4 minutes per side (depending on the burger thickness), or until they reach an internal temperature of 165 F.
Serve the burgers on ciabatta buns, with the lettuce on the bottom and the Blue cheese celery mixture on top. In a medium mixing bowl, whisk together the gorgonzola cheese, Miracle Whip, sour cream, vinegar, Worcestershire sauce, salt, and pepper until well combined. Fold in celery and leaves. Mix to combine. Serve immediately on top of Buffalo Chicken Burger. What a delicious idea! I think I want to make these! Will you email me this recipe please? It is the buffalo chicken burger on the Ciabatta bread. Judy…..the recipe is in the blog post and easily printed. And yes I did use a ciabatta roll…they are available at most grocery stores.